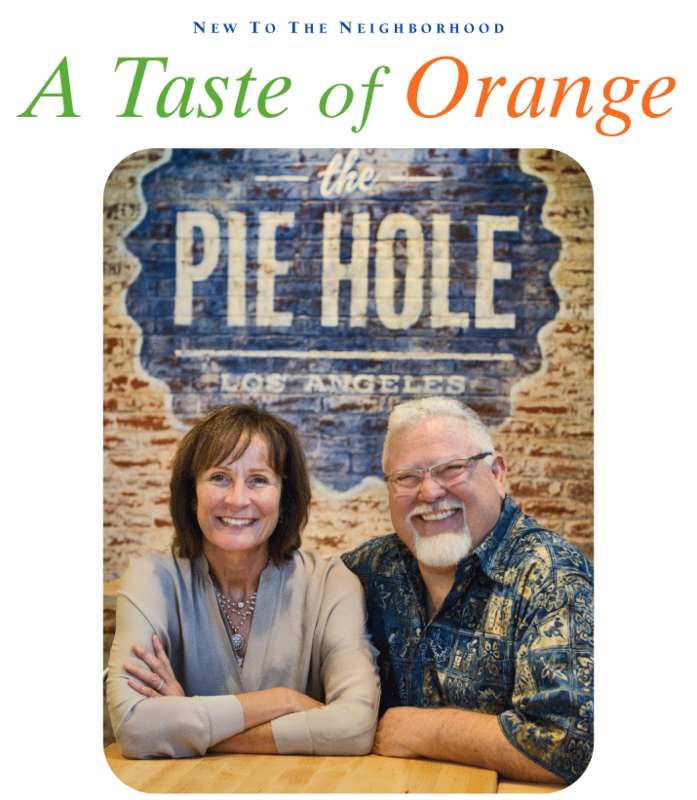 Rick and Madeliene Anaya have become the first franchisees of the family-owned Pie Hole originating in Los Angeles. The Orange location of The Pie Hole occupies the former Old Towne Grinder restaurant on North Glassell. Attracting customers is as easy as pie for Rick and Madeliene Anaya, proprietors of the newly opened, The Pie Hole, at 177 North Glassell. Located at the former Old Towne Grinder restaurant, The Pie Hole presents fresh-baked sweet pie by the slice, plus individual savory pies like Shepherd’s Pie, Sausage Rolls, Veggie Curry and Mac ‘n’ Cheese. Comfort cuisine is the operative word at The Pie Hole, where Chicken ‘n’ Cornbread comes out piping hot fresh out of the oven. For breakfast, pies include the delicious Mushroom, Feta, Spinach & Egg Hand Pie, the Swiss & Leek Quiche and the Pork Chorizo, Cheddar & Hash Brown Hand Pie. The Pie Hole is open at 7 am to catch the breakfast crowd, says Rick. The enterprising couple is the first to become franchisees of the family-owned Pie Hole, which opened five years ago to rave reviews in Los Angeles and Pasadena. The concept was created by mother-and-son duo Becky Grasley and Matthew Heffner, his wife, Lindsay, and close personal friend Sean Brennan. Having previously owned an international educational company with language schools in London, Germany and Canada, Rick had just retired before starting to look for something new to take on. After purchasing the former Old Towne Grinder restaurant outright, the couple completely remodeled the kitchen and front area, also adding awnings and outside seating. The tables are crafted of maple butcher block, while the counter is clad in repurposed wood from Washington. The concrete floors have been sanded and polished to a beautiful shine.